Eggless brownies are a great alternative to the traditional version that includes eggs. Traditionally, people find something very comforting about brownies. Whether it is the memories of childhood, the rich, sweet taste, or the fact that they are a special treat, brownies are much loved by people of all ages. Vegans, however, may have found they were missing out on this delight as traditional brownie recipes contain egg. Egg is used to give moisture and to set the ingredients. While eggs may seem an essential part of brownie recipes, it is very straightforward to prepare eggless brownies with readily available store cupboard ingredients. A range of egg substitutes are perfect for using in brownies. Some enhance the flavor of the eggless brownies, whereas, others are almost tasteless and simply provide moisture and bulk. Experiment with different substitutes and find out what works best for you. Bananas - a popular egg substitute and are frequently used in eggless brownies, bread and muffins. Bananas provide moisture and bulk, however they also have a distinctive taste. This means they may overpower more subtle flavors in some recipes. Other fruit and vegetables - a variety of fruit and vegetables make good egg substitutes including carrots, zucchini and even potatoes. These are mashed and added to the brownie mix. Carrots and zucchini, in particular, give a light texture to the finished brownies. Nuts and seeds - often used as an egg replacements. They are ideal for using in chocolate brownies where the nutty taste complements the rich chocolate flavor. These are a great addition for vegans as nuts and seeds are an important source of nutrients. When making brownies that are going to be shared with other people it is important to check for nut allergies. Flax seed - a useful and versatile store cupboard item for vegans and vegetarians. Flax is high in protein and the natural oils add a richness to food. Ground flax seed is a useful ingredient in eggless brownies. Flax is easy to grind at home, particularly when using a flax seed grinder. An alternative to baking eggless brownies from scratch is to use a store-bought mix. This can be a convenient way to make brownies and is ideal for last minute treats. Special vegan mixes are available from health food and whole food stores, however many traditional brownie mixes can be adapted for use without eggs. While this may work well for non-vegans, vegans will need to check the ingredients for dairy products such as milk powder or butter. 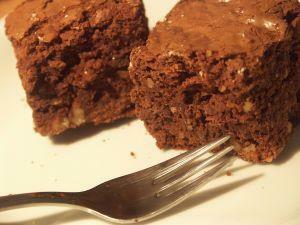 All Recipes - this popular vegan brownie recipe has many positive reviews. Reading the reviews may also give ideas for variations to the basic recipe. RecipeZaar - this interesting recipe uses apple sauce as one of the main ingredients. Traditional brownie recipes can often be adapted for egg-free cooking by simply replacing the eggs in the recipe with your chosen egg substitute. Do remember, however, that some egg replacements have a strong flavor and can alter the finished taste of the brownie. With a little ingenuity, many recipes can be adapted to eggless cooking and this means that a range of tasty delights are available even if you follow an egg-free diet.